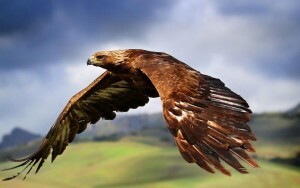 The powerful and majestic Golden Eagle is the national symbol of Mexico and Germany, and graces the Mexican flag. Because its range encompasses a huge portion of the Northwestern hemisphere, the Golden Eagle has many names, among them Royal Eagle, Aguila Reale, Kongeørn, Oakab, Steinadler, and Kungsörn! Expanding their habitat even further, North American young Golden Eagles often migrate south in the winter! From September onward, the Eagles will travel to the Southwestern United States and parts of Mexico. Inhabiting an area for life, Golden Eagles love mountainous areas and woodlands, often building their large nests, aeries, in treetops. 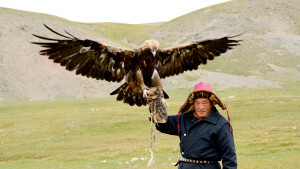 Golden Eagles often have more than one nest, but reuse them and defend the areas around them. Through the years, Golden Eagles will improve on their nests, made roughly of twigs or sticks and lined with moss or leaves. Older birds may have nests of up to six feet in diameter! Golden Eagles hunt singly or with their life-mates, and are powerful, swift predators, swooping down on prey with speeds of up to 100 miles per hour! 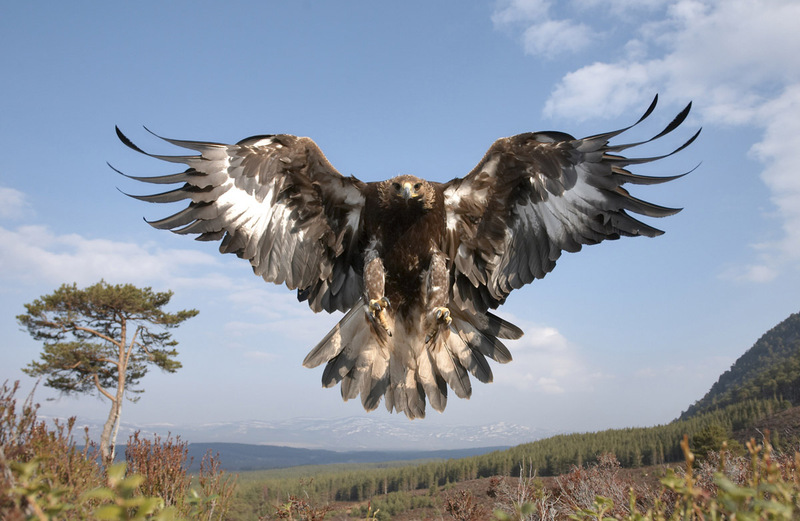 Generally, Golden Eagles soar at great heights or at lower altitudes until they catch sight of a small mammal, fish, or bird, which they will dive upon and carry back to their nest. 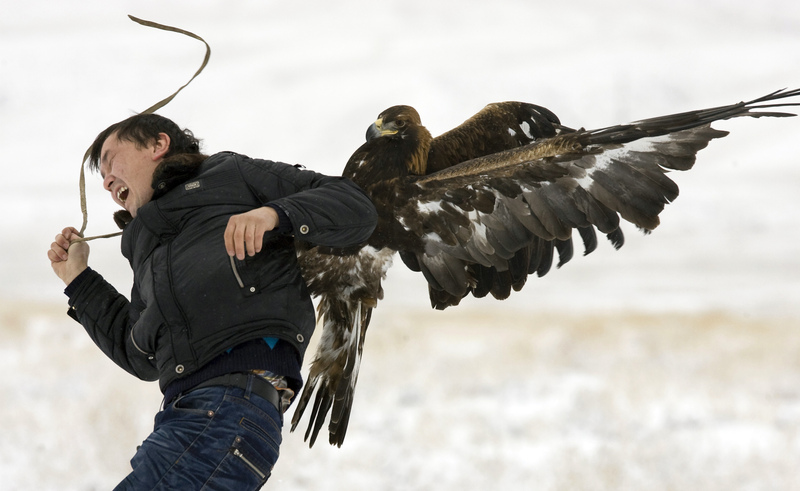 If the prey is too large, the Golden Eagle will tear it into pieces, which are more manageable, though they can take off into flight carrying up to five pounds in their talons! Rabbits, marmots, ground squirrels, snakes, fawns, songbirds, and dead livestock are typical meals. 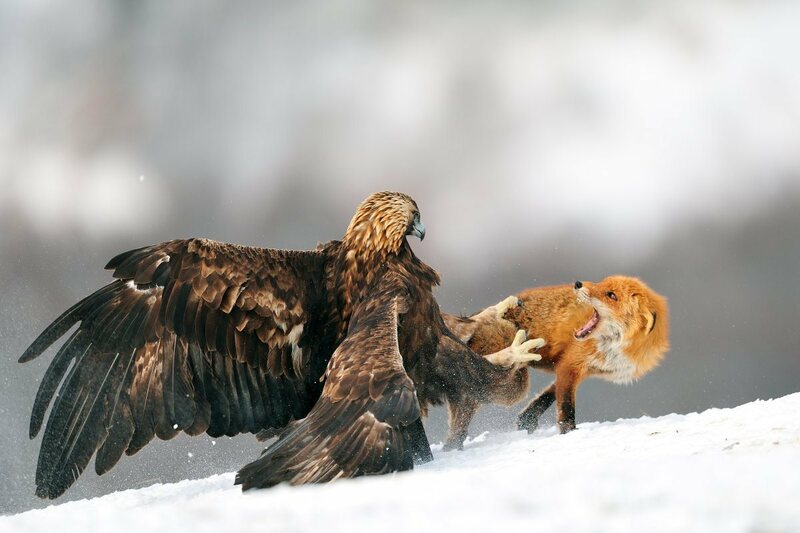 When Golden Eagles choose to eat turtles, these intelligent birds will fly into the air and then, in order to reach the meat, drop the reptile onto rocks to crack its shell. Golden Eagles are normally silent, but may on occasion shriek, bark, or make whistling noises. These lovely birds are extremely powerful, and while they are often used as falconers’ birds, they are very dangerous adversaries and may be difficult to control. They live from two to 11 years, though captives average 30. 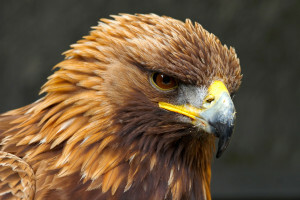 Golden Eagles are one of the world’s largest birds of prey, measuring about 30-40 inches with a wingspan of 60-80 inches. Females are often larger than males, weighing eight to 13 pounds as opposed to the six and a half to nine and a half pound male. Generally, they are a dark brown color, with golden highlights about the head and back of the neck. 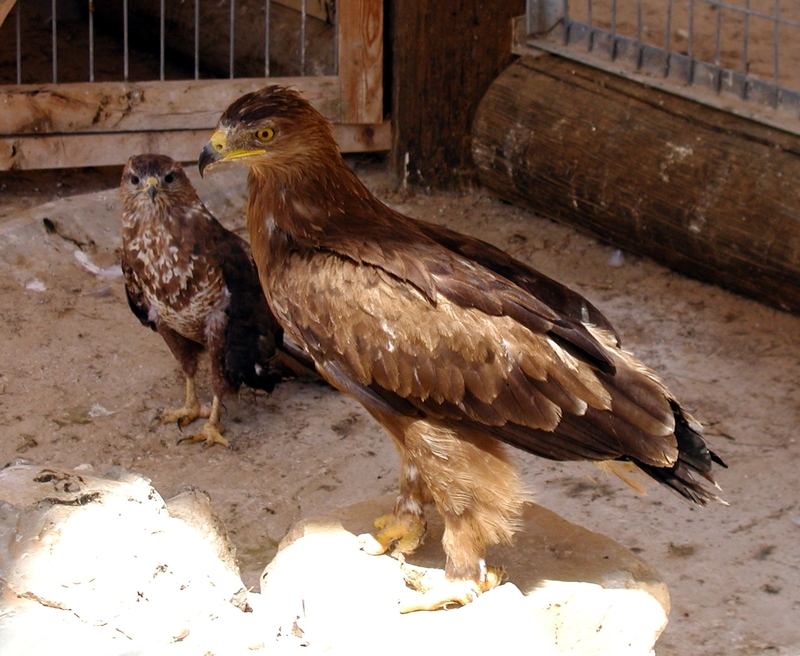 The tail usually has a black border, and young Golden Eagles may have white tails. Younger Goldens also have white patches on the undersides of their wings. The Golden Eagle’s orgigin is often called Holarctic, in other words they orginate from the entire Northern Hemisphere with exceptions. 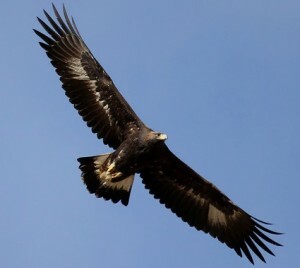 The Golden Eagle’s range includes much of Europe, save the northernmost parts. It is also found throughout North America, the Iberian Peninsula, North Africa, Southeastern China, Korea, Manchuria, Japan and even the Middle East, including Iran. Today, Golden Eagles are protected by Migratory Bird Treaty Act and the Bald Eagle Act in the United States. At one point, they were nearly extinct due to poisoning and hunting. Ranchers perceive the gorgeous birds as a nuisance when they see them eating dead livestock. 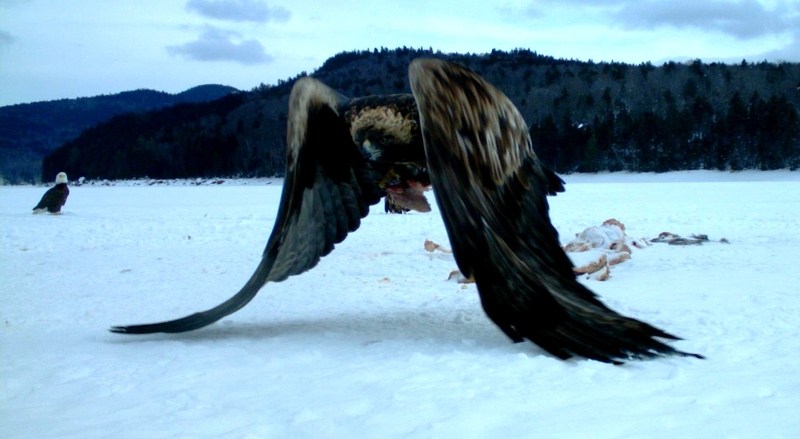 Usually, however, Golden Eagles eat previously dead livestock, as it is large and difficult to kill. Since the Middle Ages, Golden Eagles have appeared on coins and standards and have always been revered as symbols of majesty. Today they are valued as advanced falconers’ birds.